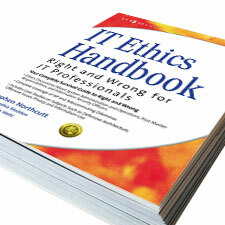 IT Ethics Handbook: Right and Wrong for IT Professionals is written for those responsible for designing, configuring, deploying, or managing information systems. It covers the ethical dilemmas around many Information Technology (IT) subjects, including the use of defensive tactics or offensive actions, user privacy, data ownership, and employer/employee relationships. Joe Grand was a Special Contributor and wrote sidebar opinion pieces entitled “Don’t Believe Everything You Hear” for Chapter 1 and “Don’t Be Afraid to Attack Your Own Network (or Products)” for Chapter 6.